Tonga moved up to second place in Rugby World Cup Pool C after they beat Namibia 35-21 with a bonus point at Sandy Park in Exeter. a brace for the Pacific Island nation. in 17 World Cup matches. vital in their battle with Georgia for third place in Pool C and automatic qualification for the 2019 World Cup. up their pool campaign against Namibia. Tonga winger Telusa Veainu also bagged a brace of tries while Latiume Fosita crossed for another. Vunga Lilo hit two conversions and a penalty, and Kurt Morath a late penalty. Namibia hit back with a first-half try from Johan Tromp and two Jacques Burger pushovers in the second. Theuns Kotze converted all three. 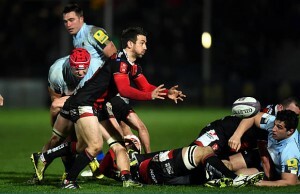 An energetic opening saw wasted chances by both sides in front of a raucous 10,000-plus crowd at Exeter’s Sandy Park. But after five minutes, a deft inside ball in midfield saw Veainu power in from halfway despite a desperate Chrysander Botha tackle on the tryline. Worringly for Namibia, Tonga were dominant in the set piece from early on, Ram riding Renaldo Bothma’s tackle for the South Sea islanders’ second try, bolting down the blind from a solid line-out. Lilo missed the conversion but produced a fantastic try-saving tackle on Russell van Wyk as the Africans capitalised on a charged-down clearance kick. When prop Sila Puafisi was stripped of the ball in contact with Tonga opting to run deep run from their own half, Namibia lock Tijuee Uanivi played provider, offloading to Tromp for an unhindered run-in for a try against the run of play. Danie Van Wyk put his body on the line to take down lock Joe Tuineau with the line beckoning, the latter’s loose pass from the resulting line-out supremely picked up by Fosita to dot down. 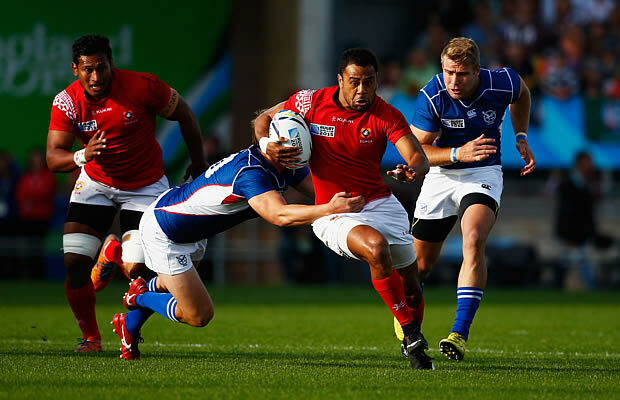 Lilo converted and bagged a first penalty with Tonga threatening to pull away. Ram was on hand for his second try — and Tonga’s fourth for the bonus point — after Veainu, a late replacement for Fetu’u Vainikolo, split the defence and found the flanker out wide. Namibia, however, were not done. A well-drilled attacking line-out saw Burger driven over in the corner, Kotze nailing the tricky extras. 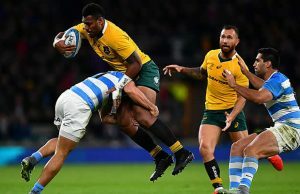 But in broken play, there was only one team in it and when the ball was shipped left with the Namibian defence in disarray, Veainu bagged his second. Saracens flanker Burger then sent the crowd into raptures when he scored a second try identical to his first, driven over from a line-out in a move that would have pleased coach Phil Davies, the former Llanelli and Wales forward. Namibia, made up largely of amateurs, remained dangerous on the break, often showing pace that would have had the onlooking, flag-waving Frankie Fredericks, winner of four Olympic sprint silver medals for the southwestern African nation, purring with satisfaction. But Tonga’s superior tactics and hard-hitting defence led by Leicester-bound flanker Opeti Fonua meant there was only one winner. Replacement Kurt Morath kicked a late penalty to steady nerves in the late-afternoon sun.